The thoughts, musings, reviews, and travel updates of Bacon. This is Day 4 in a series. You might want to checkout the previous day, or start at the introduction. What does it mean to be human? I love it when shows ask that question, especially in connection with technology. It probably has something to do with the whole being-a-computer-science-major thing. It's a question asked by many different TV shows and movies. The Matrix looks at what reality is, while Ghost in the Shell examines what separates man from machine. Ghost in the Shell: Stand Alone Complex is one of my top anime because it is so thoughtful. It raises real philosophical questions about life and tries to engage its viewer to consider them. 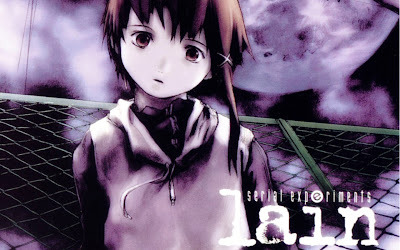 The other day, I was feeling like watching a philosophical show like that, and I stumbled onto Serial Experiments Lain. It's an older show, but it had some pretty good recommendations, so I figured that I'd check it out. Doesn't this just scream "Trippy"? Serial Experiments Lain is all about the question "what is the internet?" Lain is a middle school girl who has always been a little different from the other girls. She has always been quiet, and has avoided getting a computer for many years. However, one day she decides to get one, and suddenly she is spending all of her time building a massively powerful computer and connecting to "The Wired," the show's version of the internet. One day, one of her classmates commits suicide. Shortly thereafter, everyone in her class gets a text message from the dead girl. She claims to simply have shed her mortal body, and has now gone to live in the Wired. As the show progresses and Lain spends more and more time on the Wired, she starts to change. She is soon no longer the quiet little girl she was at the start of the show. In fact, she is even hearing stories of a girl in the Wired who looks exactly like her and who calls herself Lain doing very dangerous things. People are scared of that Lain, because she is an unstable character. She is the kind of person who will laugh while forcing someone to commit suicide. Lain finds out that the man who created the Protocol 7 version of the Wired is dead, but is also living on in the Wired. He talks with her, and claims to be the god of the Wired. Lain then finds out that she is the same as the Lain of the Wired, and that she is the copy. Her real self has always existed in the Wired. She even has the power to control people. A lot of stuff happens in between, but at the end of the series, she defeats the Protocol 7 creator and takes on the responsibility of living in the Wired watching over people. Honestly, the show was so trippy that I can't remember what exactly went down. I was really confused for most of the show, and the summary above comes in large part from the show's Wikipedia page. But the show makes you wonder: what happens when the internet and the real world start to come together? Will we become all-powerful beings with no need for bodies? Or will we end up destroying ourselves because of our lack of restraint? Aside from the pacing of the show (which was really slow), there were a couple of things that stuck out to me while I was watching, both of which are really obvious as soon as you start watching. The first is the art style. Whenever Lain is walking to school, she goes along the road to the train station. This road is always drawn in a very washed out white with only the shadows visibly different. However, the shadows aren't simply black. No, they are filled with red splotches. According to Wikipedia, the splotches represent the Wired's presence everywhere. That's not what I saw in them though. I saw a glimpse inside the mind of a poor, lonely little girl trying to find a way to release her mind. The other part that I really noticed was the sound design. There was not a lot of music in the series that I can remember, but I don't think that the buzzing will ever leave my mind. 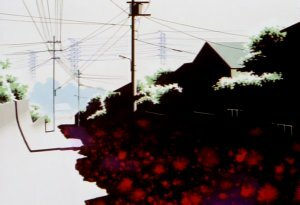 As Lain walks around the town, we can see the electric wires that carry the Wired around from place to place, and they are always humming. There's just a simple electric buzz permeating the air, making it hard to think straight. The buzz in combination with seeing the splotches makes for a very interesting design style. All in all, I wouldn't recommend this show to anyone but the most die-hard of people who like to ponder existential questions. It's only 13 episodes long, but those 13 episodes took me a couple of months to get through, just because it is such a slow show. It brings up lots of good thoughts, but the show itself is hard to slog though. If you really want to watch an existential show, you should watch Ghost in the Shell: Stand Alone Complex. It deals with a lot of questions as well, but has the added bonus of being well written and having characters that you actually care about. Make sure you watch both seasons though. The second season is better than the first, but you have to watch the first to appreciate the second. I don't remember the show as well as I thought I might, so I guess I'll call it there as I run out of things to say. Tomorrow we'll do the last one of these for this March Break: a themeatic analysis of an epic space opera. Blog by Bacon. Awesome Inc. theme. Theme images by enot-poloskun. Powered by Blogger.